Last Wednesday Anthony submitted our incorporation application to the Department of Commerce. Hooray! We’ll hear back from them some time next week. If we get the big thumbs up, we’ll make our constitution available online, then hold an AGM soon after. We are in the process of seeking funding to produce a series of video profiles of local game developers and their games for a possible public screening scheduled for early next year. We’ll be on the lookout for interview candidates at our next event in August. We won’t be just looking at the most polished or flashy game but also the story behind its development. Speaking of our next event, we’ve been corresponding with ECU to secure a venue for our next event. It is looking good, and we plan on visiting the Mount Lawley campus next Monday to check out their facilities. RocketHands has released SpaceCrash version 2.0. Check it out on the App Store. Ben 304 has released the first demo of his latest game City. 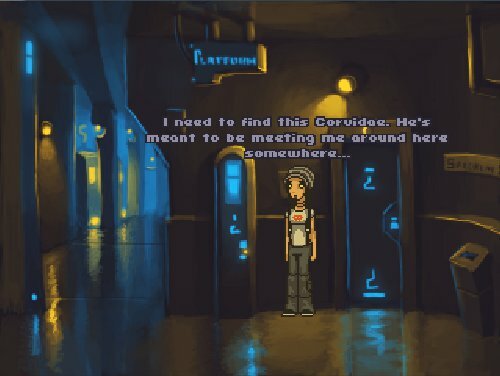 A screenshot of his game adorns our post and it was developed using Adventure Game Studio.